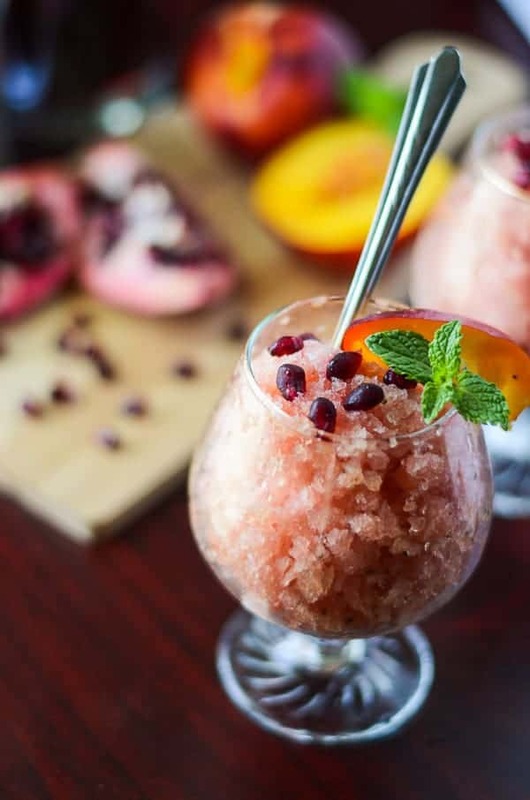 Made with fresh mint simple syrup and ripe Georgia peaches marinated in PAMA Pomegranate Liqueur, this Peach Pomegranate Mojito Granita is a true crowd-pleaser! More frozen treats! 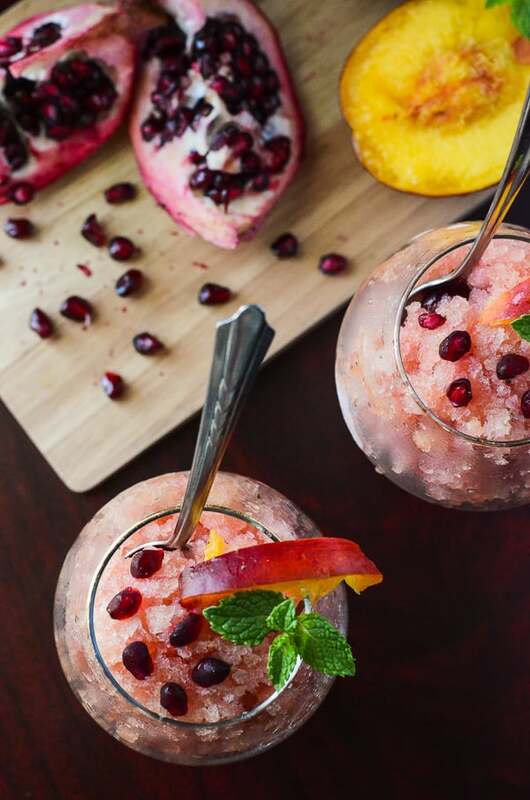 Today, on this glorious, pre-Independence Day Friday, I bring you more frozen treats, in the form of this boozy, crazy delish Peach Pomegranate Mojito Granita! It’s OK if you just eyed me through your computer as if I just made up a word to rhyme with “mojito.” Even though it doesn’t, HAHA joke’s on you. Say it with me: Grah-knee-tah. Granita. I promise you, it’s just as easy (like, 5 ingredient easy) to make as it is to say. It might not be that easy to share, though. 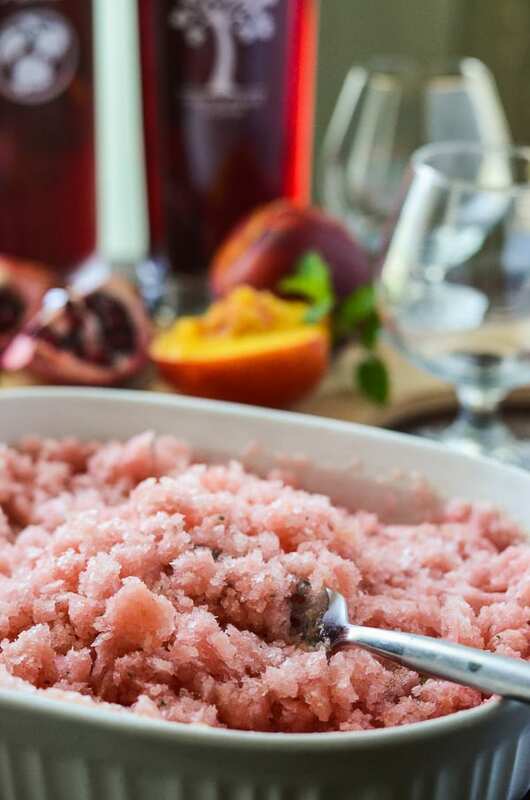 Granita is, essentially, a fancy Italian word for “shaved ice.” Yep. My friends, you’re looking at a boozy snocone. In a glass. That’s made with real fresh peaches (OMG I heart peaches) and real mint leaves. And, of course, some of that fabulous PAMA Pomegranate Liqueur that I raved about on Monday. I also raved about how much I adore a good pool party with my nearest and dearest pals. I got so revved up about it, I’m actually going to make it happen! I’ve started plotting my ideas for food and decor on Pinterest, and ordered a multi-pack of mini beach balls to use as invitations! Now, I just have to decide which friends’ pool I’m going to hijack, since our backyard’s idea of a party is a hammock under a couple of camphor trees. Mr. Crumby and his boys can take care of the grilling (the burgers, hot dogs, and requisite corn-on-the-cob,) while my girls and I take care of mixing up a big batch of my Pomegranate Summer Sangria, throwing together a luxurious sort of potato salad, eating all the guacamole, and dishing out big portions of this refreshing mojito granita for all the grown ups. The kids can stick to the Firecracker Cupcakes. Is your dream summer party anything at all like mine? Personally, those all sound like a great time to me, and PAMA wants to help being those parties to life for five lucky Pinners! To learn more about their “Celebrate Summer” Pinterest Contest, stop by their website. Entering is SO easy, and it involves something you probably already do on the daily – pinning! But hurry up – the contest ends July 20th! If you need a little inspiration, check out my #PAMACelebrateSummer Pinboard – and I highly recommend pinning this sweet mojito granita recipe so you don’t lose it! Good luck! 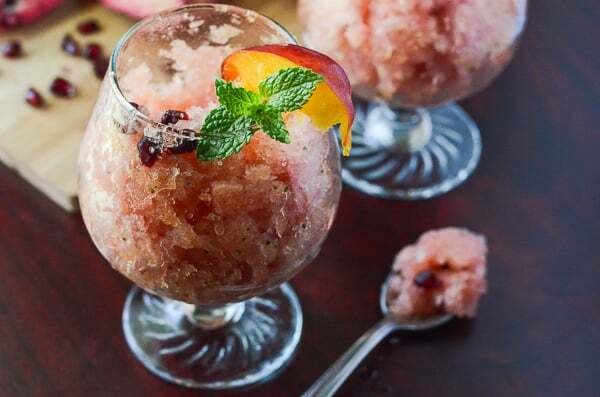 Made with fresh mint simple syrup and ripe Georgia peaches marinated in PAMA Pomegranate Liqueur, this fancy shaved Italian ice is a true crowd-pleaser! 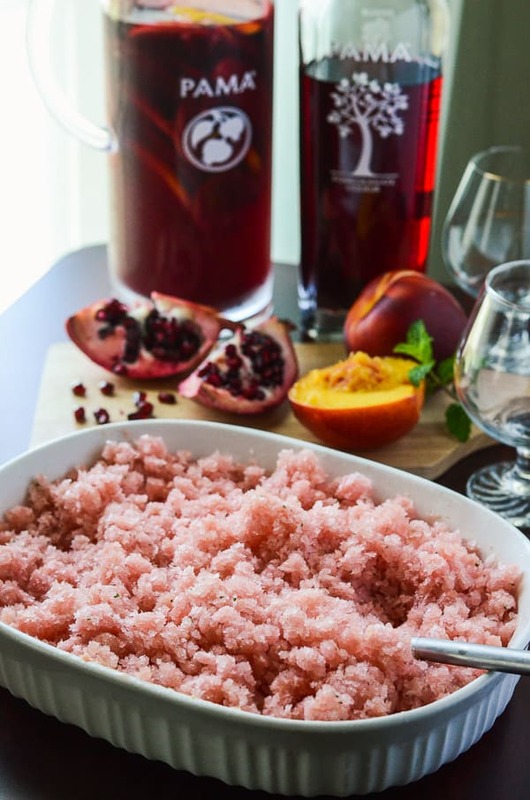 Place peaches and PAMA Pomegranate Liqueur in the pitcher of a blender. Muddles the peaches in to the liqueur and let marinate for 30 minutes. In a small saucepan, stir the water, sugar, and mint leaves together and bring to a boil, then simmer for 5 minutes. Remove from heat and cool to room temperature. Add mint simple syrup to marinated peaches in the blender, and pulse until evenly pureed. Pour mixture into a 13x9x2-inch nonstick baking dish. Cover and place in freezer. 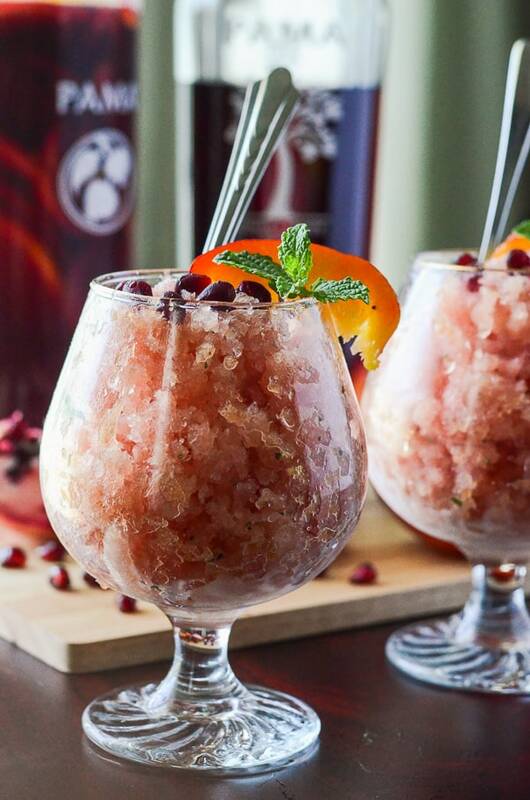 Allow granita to freeze for about 30-45 minutes, until the outer edge becomes icy. Using a fork, stir the icy portions into middle of pan. Freeze until granita is frozen, stirring the edges into the center and fluffing every 30 minutes or so for about 2 hours, until it resembles fluffy shaved ice. Cover tightly and keep frozen. Scrape before serving. Granita can be made 3 days ahead. What’s one of your favorite summertime memories? THIS CONTEST HAS ENDED. CONGRATS TO THE WINNER!